The classic British red telephone box from Cromhall quarry is used for the front cover of BSoUP's In Focus magazine. 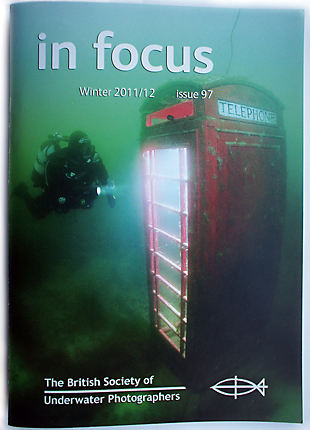 The classic British red telephone box from a flooded inland quarry is used for the front cover of BSoUP's In Focus magazine, winter 11/12 edition. Also published in Dive magazine. This twice yearly publication showcases much that is best about the British Society of Underwater Photographers - great images and features. For this shot three YS110 strobes linked with fibre optic cables and fired with a Heinrich Weikamp RSU slave trigger. Thanks to Rob Bailey for his patient modelling.